Double capstan machine with ruby tape head contact Sensor. The machine monitored the tape path and would adjust tape / head contact to always be proper. Machine calculated distortion and added back an exact anti-distortion signal to maximize signal quality. High headroom electronics, the machine still had very low distortion at +15. Super accurate jog wheel and tape scissors. Find your edit point and then hit a button which moved the tape to the exact scissors cutting position. Superb TACO M1 Meter bridge with VU and peak meters and monitor speakers. High dynamic range machine. With Dolby SR, signal-to-noise ratio exceeded 99dB-greater than DAT tape. Shipping worldwide ensured. Customized wooden crate, 265 lbs. (120 kg). Original box, manual and accessories. Shipping worldwide ensured. Customized wooden crate, 176 lbs. (80 kg) per crate. Introduced in 1976, the EMT 950 Schallplatten-Wiedergabe-Maschine is a formidable machine indeed. Built without any compromise in matters of cost, weight, size and aesthetics, it was introduced in two types, ‘Standard’, (‘950’, 693 millimeters wide) with controls on the left side of the disc, and a ‘Narrowline Model’ (‘950 E’ or ‘Schmale Ausführung’, 519 mm wide, 573 mm deep, introduced at the end of 1977) conceived for less spacious studios; the ‘narrowline’ 950 had the same controls, but its pushbuttons were all lined up in the front panel. 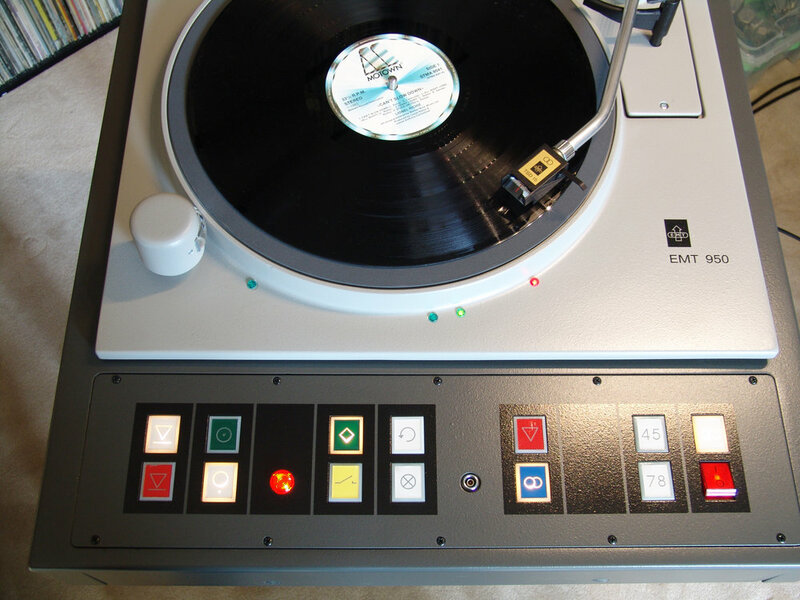 Starting time at 33 rpm was 200 milliseconds, and, just pushing a button, the record would rotate backwards to find the beginning of a track: the user could monitor the cueing with the inbuilt speaker. Both machines could be mounted on their own ‘legs’ or in a console; the shock absorber frame was built-in. In stock form, whichever the cabinet, the ‘950’ had three speeds (33, 45 and 78 rpm) with automatic selection of 33 or 45 at the raising of the central adapter for the smaller records, a ‘929’ arm in stock aluminium finish with brass or black counterweight and a ‘TSD15’ Tondose with ‘4 150 056’ transformers on the equalizer board ‘7 950 038’ or ‘7 950 088’ board (‘9 950 110’ or ‘narrow’ ‘9 950 210’). It was possible to order a tailor-made 950 to suit any professional need, provided that the customer could pay the extremely high prices of this machine. In 1976, 15.000 Deutsche Marks was the basic list price of a 950. Original manual. Shipping worldwide ensured. Customized wooden crate, 176 lbs. (80 kg) per crate. It is DH-710F which further enhanced the performance of full-fledged high-performance open deck DH-710S developed by DENON for audiophiles, continuing to build broadcasting machines and business machines. The transport of DH-710F is a 2-capstan drive system with direct drive, by adopting electronic tension servo which gives ideal conditions for tape, to achieve stable tape running, and also consideration for tape safety doing. DENON's latest technology is also used for heads, recording and playback amplifiers, operability, etc. We have adopted a continuous variable adjustment method of bias and equalizer which makes maximum use of the characteristics of tapes in particular. The DH-710F pursuing higher performance realizes modulation noise, wow and flutter reduction, high SN ratio, low distortion ratio, and performs very high fidelity recording and playback, so advanced audio mania, I am convinced that music fans will be satisfied satisfactorily. The capstan drive adopts a 2-capstan drive system with a sub-capstan coupled with this capstan motor shaft and a non-elastic belt, which is a direct drive system based on a servo system adopting a magnetic recording playback system for speed detection I will. Therefore, it is stable against fluctuations in tape tension and fluctuation of large load at the time of rise, and features such as wah / flutter (0.02% wrms or less, 38 cm / s) and modulation noise are also excellent. By adopting the tension servo, keep back tension at the time of recording and playing constant, and keep head touch more stable. As a result, there is no change in tape speed due to winding diameter of supply side tape, increase in wah / flutter and modulation noise. Even during fast winding, the tape tension is kept constant, and it is wound on a reel with moderate hardness. The tape running system between the left and right tension arms is designed to be as linear as possible. Moreover, except for the head, all parts except for the head are made to be special guide rollers, and one-way air damper is adopted as a tension arm to prevent excessive tension at the start. This made it easier to manipulate the tape, and the tape stain was drastically reduced. Denon adopted newly developed Sendust alloy head (track width 2.1 mm), so S / N at playback is further improved, and we maintain stable performance even for long time use. Since the reproducing head is finished in a special shape, the shape effect at 38 cm / s is reduced, and the distortion rate characteristics are also improved with high-performance recording / reproducing amplifiers. When fast-forwarding or rewinding, the tape can be brought closer to the playhead, so you can find the part recorded by the playback sound, which is useful for editing the tape and locating the playback sound. Since the maximum output level of the recording amplifier using the push-pull circuit has a margin of 30 dB or more (1 kHz) with respect to the reference level like the business machine, distortion due to the saturation of the recording amplifier is recorded , Almost none. Since it adopts the continuous variable method of the bias amount and the recording equalizer characteristic, it is possible to set the optimum bias amount and equalizer characteristics with BIAS, EQ knob and VU meter on the front according to the tape separate adjustment table. Therefore, linearity and frequency characteristics can be set to the best state. Because it has an attenuator switch that attenuates by 12 dB, it can switch according to the sensitivity and usage condition of the microphone so you can record a microphone with a good SN ratio and a wide dynamic range. In addition, since the margin of the microphone amplifier is 55 dB in any case, it is rare that it saturates with the amplifier. Since it does not hurt the tape, even if you push the play button during fast forward or rewind, it will not play. It is designed to prevent playback / recording unless the tape (reel motor) stops. When tape running is finished, the mechanism is automatically stopped by photoelectric tape end sensor. Since 4 track reproduction head is installed, 4 track tapes can also be played by the head housing changeover switch. The machine is ready to use it, plug & play. Shipping worldwide ensured. Customized wooden crates. The Pioneer RT-2022 is a professional tape recorder system. 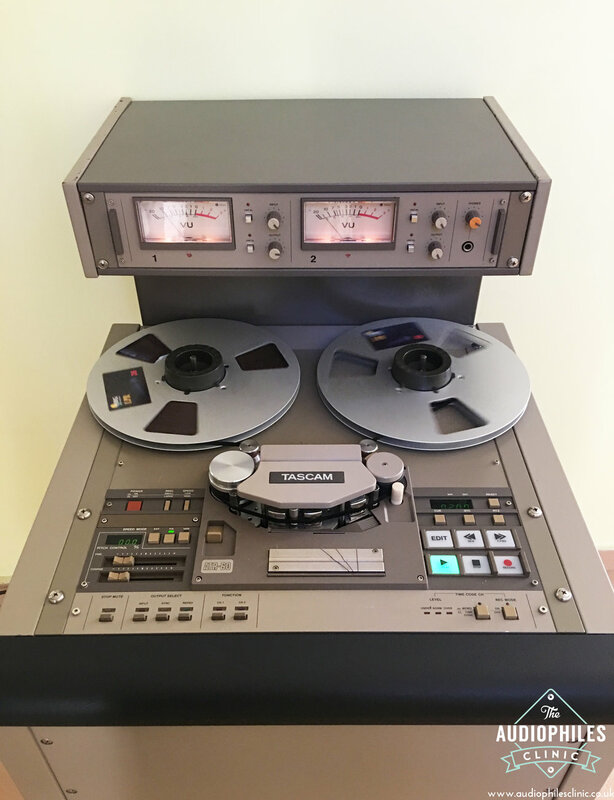 This professional grade tape deck was the most expensive open reel deck Pioneer ever made. Introduced in late 1976, they utilised the RTU 11/2T transport unit and either one or two TAU 11 pre-amplifiers. They were, of course designed for 10½" reels and could record and play back at both 7½ ips and 15 ips. Is equipped with three heads, two-track heads with two channels. Was considerably larger than the other open reel decks in the Pioneer line. The RT-2022 measured 18¼" w x 21¾" h x 10¾" d and weighed over 62 pounds. Features include 2-tracks, 2-channels, 3 motors, capstan drive, 38 and 19 cm/sec speeds, separate read unit and separate record and playback amplifiers. Shipping worldwide ensured. Customized wooden crate.